Is that a dead leaf or an insect clinging to a branch? About this time each year, as the weather gets gloomy and bugs become scarce in Maryland, Bug of the Week heads to warmer destinations to meet fascinating creatures. This week’s episode takes us to the eastern coast of Australia to meet the Macleay’s spectre, a.k.a. the giant prickly stick insect or Australian walking stick, so named after the famed British naturalist William Sharp Macleay who described this magnificent insect. We met other charismatic members of the walking stick clan such as the twostriped walking stick, northern walking stick, and the elegant phasmatid in previous episodes. Females of this giant of the insect world measure more than five inches across from the tips of their outstretched forelegs to the tips of their hind tarsi (analogous to toes). And these are massive insects, with fully grown females weighing more than a thousand times that of a common housefly. To generate this much mass Australian walking sticks consume large amounts of foliage. In their native realm the diet consists of leaves of eucalypts, but our colony here at the University of Maryland thrives on foliage of local plants, including leaves of Photinia. With this much juicy biomass in play, one might think that predators like magpies or leaf-tailed geckos would find these to be excellent tucker. Ah, but Macleay’s spectre has several tricks to defeat the beaks and jaws of hungry predators. Smaller male Australian walking sticks also use expanded body parts and unusual postures to deceive predators by resembling withered parts of plants. Trick number one, look like a dead leaf. With expanded plates on outstretched legs and an unusual posture of arched abdomen and thorax, a resting walking stick appears to be nothing more than a dead leaf waiting to drop from a plant. This camouflage could easily fool a visually astute predator searching for the symmetrical lines and characteristic shapes of other insects on the menu, such as beetles or butterflies. Trick number two, sway in the breeze. Many walking sticks, including Macleay’s spectre, gently rock their body to and fro when a temperate breeze or vibration disturbs the substrate on which they rest. Scientists believe that predators learn to overlook irrelevant environmental cues, like leaves swaying in a breeze, as they hunt for tasty insect prey that often move in characteristically buggy ways. By swaying like a leaf or twig in the wind, walking sticks may send the would-be predator a “these aren’t the droids you’re looking for” message and be overlooked by their enemies. This feat of deception has been called motion crypsis. Whether slowly pulsing in a non-existent breeze or leisurely devouring a leaf, this mistress of disguise is a wondrous and magnificent creature. A startling display of bristling spines warns predators to think twice before attacking. Trick number three, show them your spines. Playing the part of a hungry predator, I reached out to grab a large female walking stick and was rewarded with a threatening display of outstretched forelegs, head arched backward, and abdomen arched forward, all body parts bristling with a phalanx of nasty looking spines. This posture clearly was a warning to attack only at risk of imminent pain – a challenge I foolishly accepted. Trick number four, impale the enemy! As I grasped Macleay’s spectre, she forcefully embraced my fingers and hand, stabbing my skin with several spines that failed to draw blood but nonetheless left a lasting impression. I imagine a bird or lizard biting into a mouthful of said spines might forgo an attack on another walking stick at the next encounter. A perimeter lined with stout spines turns the hind leg of the walking stick into a formidable weapon. Trick number five, leave them something to remember you by – autotomy. As my grip on the walking stick loosened, I found a portion of a leg attached to the palm of my hand by spines embedded in my flesh. The strange behavior of discarding an appendage when attacked by a predator is not uncommon. Many insects, including crickets such as camel crickets we met in a previous episode, are able to shed a limb on demand. A special muscle allows a leg or antenna to snap off at the insect’s bidding under threatening circumstances. This phenomenon, known as autotomy, allows the insect to lose a leg and save its life by distracting the hungry predator. When the predator stops to examine or eat the severed limb, the bug makes its getaway. In my case, I was indeed fascinated by the spines stuck in my skin and for a few moments I forgot about the walking stick as it quickly and quietly ambled away. Clever morphological and behavioral adaptations allow this grotesquely beautiful giant to best its enemies and survive in a land down under. We thank Todd Waters and Chris Sargent for maintaining the Insect Petting Zoo at the University of Maryland, and thereby providing the inspiration for this week’s episode. We thank Men at Work for ‘Do you come from a land down under?’…but what does “where women glow and men plunder” mean? 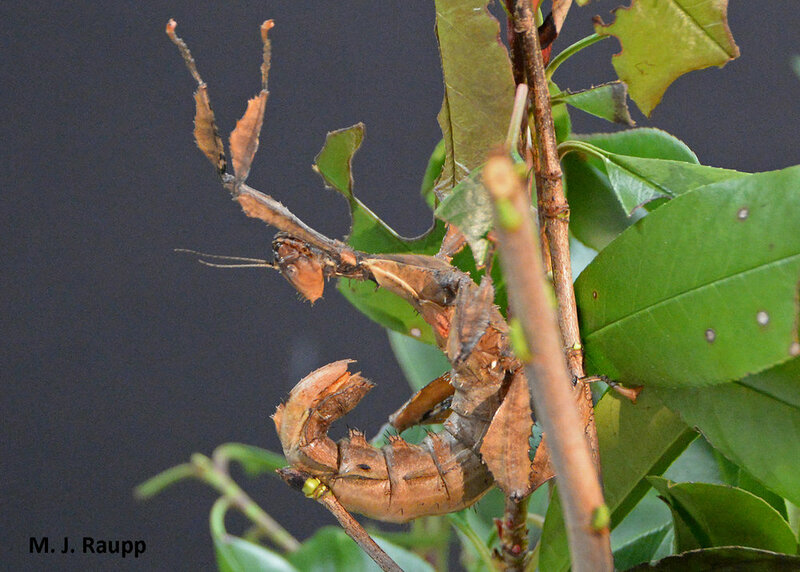 The interesting article, “The swaying behavior of Extatosoma tiaratum: motion camouflage in a stick insect?” by Xue Bian, Mark A. Elgar and Richard A. Peters, provided fascinating insights into the quirky behaviors of Macleay’s spectre.